There are many high-profile eyesores and abandoned lots across Boston that merit the attention, imagination and hustle of the next mayor. But few loom as large as the Leon Electric building in Uphams Corner. 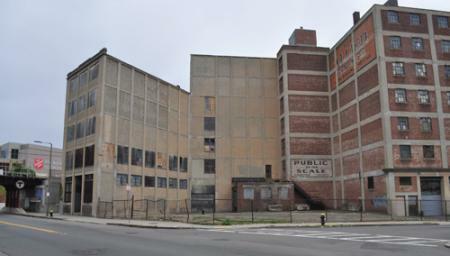 The hulking warehouse complex sits right next to the MBTA commuter rail station at the corner of Dudley and Humphreys streets. The empty, fenced-off, weather-worn behemoth rises up seven stories and casts a foreboding shadow over the neighborhood business district below. Once upon a time, this blighted 50,000 square foot block fit right in on Dudley Street. Not anymore. On the other side of the tracks, New England’s largest community center— the Salvation Army’s Ray and Joan Kroc Center—symbolizes the new Uphams Corner, a neighborhood on the rise. The T station — once a forlorn and lonely place — now bustles with some 40 trains and passengers eager to just-lowered fares for a ride into South Station. The Fairmount Line’s renewed viability isn’t just good news for T riders: It presents a whole new opportunity for city planners to revisit long-abandoned hopes for redevelopment along the whole line. A Boston Redevelopment Authority working advisory group has identified the Leon Building as one of the top targets for redevelopment along the entire rail corridor. Missing link on Dudley: A report prepared for the BRA envisions a potential re-use of the Leon Electric parcels. A report commissioned for the group envisions the building and adjacent, vacant parcels be replaced by a mix of housing, office space and retail with parking on site. Conceptual sketches show gleaming new buildings that connect to the adjacent T station— with as many as 200 units of housing above street-level stores and restaurants. But, to date, the prospects of any such transformation have been stymied by a family trust that controls the two key parcels along Humphreys Street and has opted to let the vacant block lie fallow for decades. The Leon family has resisted earlier attempts by city and community development officials to engage them in redevelopment talks over the years. “As Mayor, I will work closely with the Fairmount/Indigo Line Coalition and neighborhood residents to continue and strengthen efforts to develop vibrant urban spaces along the Fairmount Corridor and ensure that communities clustered around this historic stretch of Boston neighborhoods are surrounded by open rather than vacant storefronts and accessible public open space rather than empty lots. “The Leon Building has been an eyesore and missed opportunity in the Uphams Corner neighborhood for too many years to count. Numerous parties, including DSNI, have attempted to engage the building owners in a conversation about purchasing the property or partnering with the owners to develop the building in a way that would benefit the neighborhood, only to be rebuffed at every turn. In terms of possible uses, past and current planning studies of the building show that a mixed-use of housing and commercial is the most feasible option for the site. The community has stated a clear demand for mixed-income housing to ensure that residents of all income groups are able to remain in the neighborhood. In terms of commercial, residents have expressed their desire for retail uses that complement the T station, such as a coffee shop/restaurant, as well as other independent businesses. In addition, the Leon Building could be a great site for a “Fab Lab,” and other artist/production spaces that would build on the great work of the Uphams Corner Artplace Initiative to establish Uphams as a hub for local arts and culture. “The Humphrey Building is an eyesore now, but holds the potential to transform the entire surrounding community. I would consider this an all hands on deck project and would deploy everyone from the Boston Redevelopment Authority and Department of Neighborhood Development, to the Transportation Department, Environment and Environment and Energy Services, Parks and Recreation, and Inspectional Services. I would ensure the full participation of the Small and Local Business Enterprise Office, Boston Residents Jobs Policy Office and Boston Main Streets, as well. The Leon Building is about more than one building redesign or refurbishment, but a dramatic opportunity to strengthen an already good and growing community. I am a proponent of transit oriented development and the Leon Building’s close proximity to the Upham’s Corner Station on the Fairmount/Indigo Line represents a major opportunity to attract new commercial investment, locate small businesses and retail enterprises on the ground floors and create a mix of housing and even commercial space above, with the housing a mix of workforce and affordable. “The best thing the next mayor can do — rather than micromanage the development of individual properties — is to significantly reform the development process in the city. We need a development, zoning, and permitting process that is driven from a thoughtful plan, a transparent process, and a customer friendly, efficient city government. The BRA and related city agencies are in need of significant reforms to make them more transparent and accountable. Stakeholders involved in the development process should have their proposals evaluated based on the merits, not based on whom they know. We have to end the conflict of interest between planning and development. We need a process where the community has real input, where we are focused on the future of neighborhoods, and where we drive development from a plan, not the other way around. And we need to stop the practice of zoning by variance — if the exception becomes the rule, then the rule needs changing. With changes like these -- changes that truly base development decisions on real planning with meaningful community input -- then the community, working together, can come up with smart solutions to questions like the future of the Leon Electric Building. Residents of the Fairmount-Indigo Corridor have articulated a long-term vision for a new Indigo line that is integrated into the MBTA’s core system, just like the Orange, Red, Blue, and Green lines, connecting them to other neighborhoods and jobs and educational opportunities. We need to ensure planning throughout the corridor and around every station area. As mayor, I will support those efforts every step of the way, but I will also move us away from an overly top-down approach to development. I worked diligently with the neighborhood groups such as Roslindale Main Streets, every city agency involved such as DND, BRA, Mayor’s Office, Transportation; also the T and other state agencies, and the developer. Because the building had historic value, Historic Boston partnered with Main Streets and their involvement made the project viable. Our work even included getting the funeral home next door to sell his parcel, which made the overall redevelopment work better. Our work began with the RFP to be issued and has continued through selection of the developer, design review, and financing, through dozens of community meetings. But it all was worth it because the neighborhood was successful. Indeed, because of the process, the best possible plan prevailed in terms of design, housing numbers, and financing. “It is complicated for the city to address a privately-owned property where taxes are current yet the unused property becomes a problem to the surrounding neighborhood. I am very familiar with the Humphrey Street site since I live five minutes away from it and have walked by and driven by it for many years. I share the belief of many in that area that the building is important to the economic revitalization of the Uphams Corner neighborhood. During my tenure as Director of the City’s Department of Neighborhood Development (DND), I made efforts to meet with the owner of the Humphrey Street Building. The purpose of the meeting was to discuss future plans for developing this property and how the City’s resources could support those plans. I brought together my staff with the owner to discuss the various financing programs the City could utilize to move the project forward and we offered the use of DND’s commercial real estate staff to help him put together a feasible development plan. In the end the owner did not take advantage of our offers of assistance. So I am also familiar with the frustration of an owner resistant to persuasion and cooperation. This site has so much potential for local jobs. Many underutilized commercial properties in our neighborhood commercial districts have similar stories to the Humphrey Street site. The property owner does not want to sell nor has any plans for development; they are current on their City taxes and have no code violations that would provide greater leverage for the City. Eminent domain is not readily available unless a clear public purpose project is underway. I have since thought about that difficulty which occurs more often than we’d like to see in the city and what are the tools at our command to do something about it. This is where an interagency strategy is essential. In addition to direct efforts from the Mayor’s Office, DND, the BRA, Inspectional Services, and Public Safety all play a role. The outreach to these site owners should continue and be ongoing with the city willing to provide some financial incentives for planning and infrastructure, where possible. The city can also continue to recruit private businesses to propose a purchase or lease that would result in a renovation and return to productive use. However, when persuasion and assistance does not work, there also should be a stringent Inspectional Services component in terms of how the site is maintained. There should be a consideration of additional legislation and/or ordinances for the standard of maintenance for these properties with fines that matter. There already exists some regulatory authority for the city to act to enforce health, safety and sanitation or to abate the problems and bill the owner. “ I recently committed to help develop 10,000 units of housing — including affordable housing — along the Fairmount Line. While the Leon Electric building presents some amazing opportunities for transit-oriented housing, we can’t keep focusing on growing Boston building by building. I represent Boylston Street in the Fenway neighborhood, which used to be lined with surface parking lots, gas stations, and fast food restaurants. A group of community members believed that we could do better than that, and so together we began a planning process to determine what the community wanted to see in that neighborhood: what types of commercial uses and density of housing; how many affordable units new developments needed; what type of building massing and building height. Because we planned first and the community articulated what its vision was, the process of developing Boylston Street was faster and easier because of the predictable planning that existed. We can and should do that in every neighborhood of the city. It brings the community together to create a vision for their neighborhood and makes development easier and more predictable for builders. 1) Provide Opportunity to Sell: If the owner is not already willing to sell, make it clear that the city is interested in brokering the sale of the property to a new owner. Using information on other available properties (having such a database would be an economic development goal of my administration), assistance could be provided to help find a new space for the needs the owner/tenant currently has. 2) If the Owner Reluctant to Sell: If the owner is reluctant to sell, I will act to hold them accountable for maintaining their property in safe and legal fashion, compliant with public health and building safety laws. Using any powers ISD may have to cite, and fine if possible, the owner for property conditions. If this were a residential property, receivership would be an option, though it cannot be used on a commercial building. In addition, the fire department can complete an inspection. If hazardous materials are found, the fire department can take action to order the removal of any material or condition creating a danger. The owner/tenant is liable for the cost of remedying this situation, and the fire department could also require a paid fire detail at the owner’s/tenant’s expense. A) Through a neighborhood planning process, proposed uses should be defined for under-utilized buildings and parcels in the neighborhood. B) The Transit Oriented Development (TOD) fund needs to be more fully funded to make sure that non-profits are positioned to take control of the property in a timely fashion, with pre-development funds available to secure the property and maintain the property through the re-development process. 4) New Uses:The aforementioned neighborhood planning process should help to determine uses. An environmental assessment would be required to determine costs of remediation. Dorchester Bay EDC could also be a crucial partner, whether or not they took an ownership stake in the property.